When you are looking for a sweet treat, you really can’t get any sweeter than these peanut butter balls! This is the best – easy no bake peanut butter balls recipe that I’ve developed (and I’ve made a lot of peanut butter balls)! These easy no bake peanut butter balls are made with powdered sugar, butter, extracts, and butter. Then they are dipped in chocolate and touched with a kiss of sea salt and some crushed walnuts. What were the requirements for my peanut butter ball recipe winner? The recipe had to be one that you could do by yourself or with a child. It needed to be a hit with a crowd – and boy were they! The secret to making these peanut butter balls so decadent? The secret to making these the best no bake easy peanut butter balls – the maple extract. Most recipes simply use vanilla. As a result of using the maple flavored extract, these peanut butter balls have a taste that is just a little unique from so many of the recipes out there. The maple extract, along with the vanilla extract really make these special. 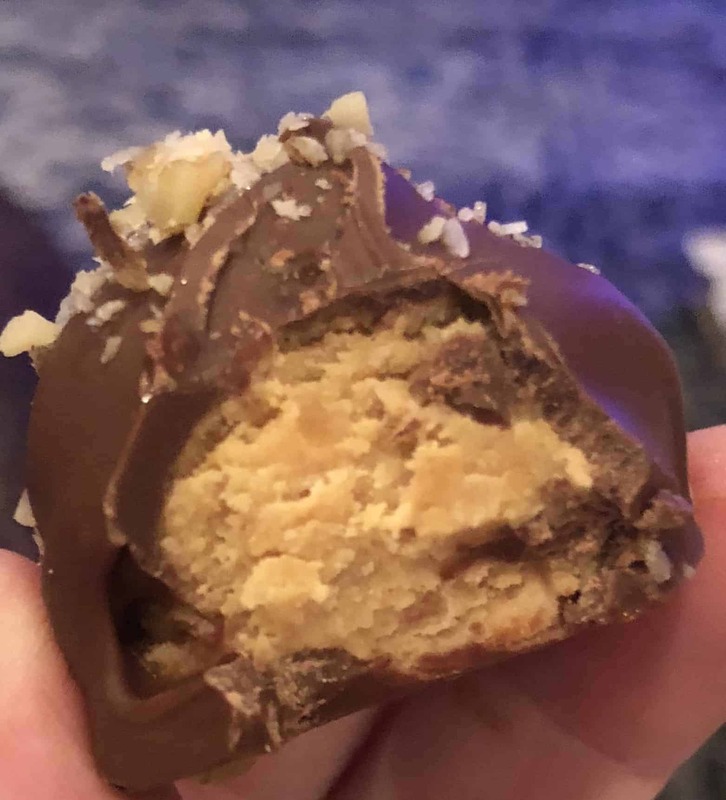 Also – the very light sprinkle of sea salt kicks up these peanut butter balls just a notch above the others! The easiest - and tastiest peanut butter balls you'll ever make! Step 1 Combine all of the ingredients except the chocolate until creamy. Measure each ball using a teaspoon scoop. Roll with your hands into a ball. Place all of the balls onto a parchment lined cookie sheet. Melt your chocolate chips in the microwave at 30 second intervals until melted and glossy. Dip each peanut butter ball into the melted chocolate, sprinkle a pinch of crushed walnuts onto the top along with a pinch of salt flakes before the chocolate sets. Roll the balls in white chocolate. Only dip half of the ball in chocolate. Mix Rice Krispies into the batter for a crunchy texture. Make the peanut butter balls without any chocolate. After they are dipped in chocolate, dip them in sprinkles. Add chocolate chips to your batter. There are so many variations you could do – above all, the possibilities are endless! It all depends on your mood and the season! Let your imagination run wild! On the other hand, there super good as is! If you give these a try let me know! I’d love to hear how much you like them! Looking for another treat? Try my Oatmeal White Chocolate & Cranberry Cookies!